Luxurious top-floor apartment in a highly sought-after, very sunny and central location i Grindelwald. The apartment has a fireplace, two balconies and large windows offering amazing views of the mountains. This modern residence connects the classic chalet construction of stone and wood with the most modern elements of architecture. One and only chalet of this style in the whole village of Grindelwald. 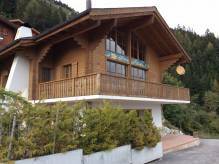 A furnished chalet at the edge of the forest 900 metres from the centre. Tree-bedroom apartment built in 2011 offering beautiful views of the Alps. Restaurants, shops and a ski resort are nearby.